Many people have heard of the South China Morning Post, Hong Kong’s main English-language daily newspaper (Chinese name: Nanhua Zaobao), which has been published continuously since 1903. But how many people still remember its mainland counterpart and predecessor, the North China Herald (in Chinese: Beihua Jiebao), which was published in Shanghai starting in 1850? The weekly Herald and its daily counterpart, the North China Daily News, were published until 1941 and 1951 respectively, when first civil war and then Communist victory put an end to many such quasi-colonial legacies. 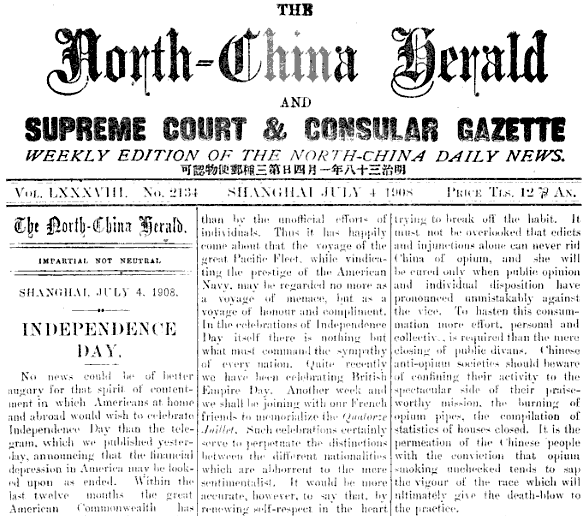 Although primarily covering the expatriate community and their legal and business doings, the Herald also boasted of its coverage of events throughout China. Many libraries now have the full text of the papers available in a digital archive. I first heard about the Herald from a journalist I knew back when I first moved to Beijing, oh these many moons ago. At that time (late 1990s), English-language expatriate magazines were springing up in Beijing, doing the usual bar/restaurant listings, but also writing about Chinese culture in a way that was unusual then (though has become almost commonplace today). According to this guy, the dream of some people behind these expat rags was ultimately to revive the name of the North China Herald, and start a real, independent English-language newspaper inside mainland China. I’m not sure why this memory suddenly sprang back to mind today, but thinking about this idea in the context of today’s China makes the late 1990s seem like a very long time ago. The idea that China would evolve in such a way that foreign-controlled media could play a major role domestically was probably never that well-founded, but it seemed less ridiculous 15 years ago than it does today. Instead of foreign-run newspapers within China, we now have CCTV on cable networks in the US, and a government that is currently blocking the websites of at least three of the biggest English-language news organization (The Wall Street Journal, The New York Times, Bloomberg). There is some independent English-language media (http://english.caixin.com/), but it is a spin-off of Chinese-language media and is largely run by Chinese people not expatriates. This gap between vision and reality I think reflects a couple of things: 1) the tendency of foreigners to think that China will evolve in ways familiar to them, 2) the tendency of foreigners to overstate their own importance in how China evolves. More generally, I do not think we should expect institutions that were the product of a China that had low income and education levels domestically, and weak status internationally, to reappear in a China with high and rising levels of income, education and international influence. And judging by the ruckus that has resulted from its recent attempts at international institution-building, China is not done surprising us yet.